Out of California, Van Halen explode onto the scene with music that mixes hyperactive metal with uncontrolled fun. Overnight, Eddie Van Halen became a guitar hero to a new generation of metal fans, and David Lee Roth's husky, overtly lecherous and smooth vocals appealed both to young men who wanted to be him and young women who wanted to be with him. 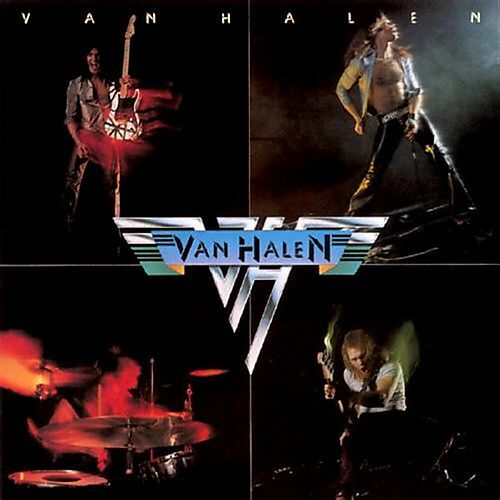 Van Halen's debut features amped-up guitar wizardry from Eddie and playful vocals from Roth. Alex Van Halen on drums and Michael Anthony on bass are good, but there is no mistaking that this band is all about the duel for centre stage between lead guitarist and lead vocalist, with the music being the main beneficiary. Van Halen is the album that paved the highway for metal to overlap with hard rock in a context where having fun was the dominant objective. That this road ended up in the dead-end of glam metal is not the fault of Van Halen - unlike what followed, Van Halen had the brilliant talent and faultless execution to earn and deserve the good times. While Eruption is Eddie's passport to greatness and became the rite of passage for guitar freaks, the album is full of metal gems: Runnin' With The Devil, Jamie's Cryin', Atomic Punk, and On Fire represent some of the best metal that the band ever created. On each track Eddie throws in original solos that redefine what the guitar can do, and etches his name as a wizard at age 23. Meanwhile, the covers of You Really Got Me and Ice Cream Man started the band's tradition of recreating classics to suit their own image. Van Halen's vibe throughout the eleven tracks is a band having a blast, mixing power with fun, and showing off ridiculous talent with consummate coolness. Regretfully, Van Halen were never able to match the brilliance of their debut. Although many of their subsequent albums were very good, when you start at the very peak, all forward directions are down. Produced by Ted Templeman. Engineered by Donn Landee.